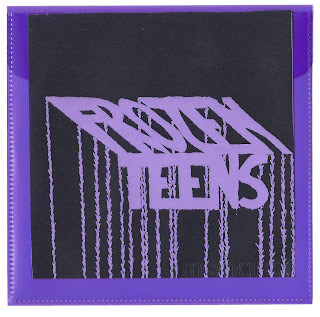 This is the first CD by the Frozen Teens, featuring members of Friendly, Cortez the Killer and Dirtyard. On a recent road trip I had the great fortune of happening upon a totally awesome new band: FROZEN TEENS. Since they’re from Minneapolis, I can’t help thinking they sound a bit like the great SUICIDE COMMANDOS with a little early REPLACEMENTS vibe… but with very much their own unique sound. The ‘Teens infectiously memorable demo sounds strangely timeless — like it was recorded in the far past — or on another planet. And the lyrics make you shiver with their simple brilliance. This CD was on constant repeat for the whole trip home, and if you don’t know: it takes a really, really long time to drive from Minnesota to California.